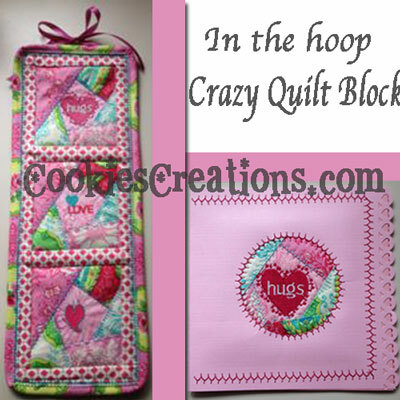 Cookie's Embroidery and Sewing Creations: Make a mini quilt wall hanging in less than 2 hours! Make a mini quilt wall hanging in less than 2 hours! Mini style quilts are perfect for Valentine's gift giving. The photo features an In The Hoop Embroidery Design available on CookiesCreations.com. The design includes both card and step by step quilt directions. 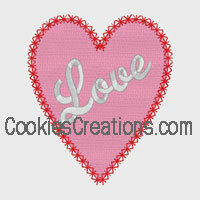 FYI, added a few new machine embroidery designs for free download on the CookiesCreationsWebsite FanPage. If you have an embroidery machine, you may want to head over and grab them while they are up as I do go in and change things up. Free Design Available on FB! However, you need not own an embroidery machine to make a mini quilt, card or a simple mug rug. 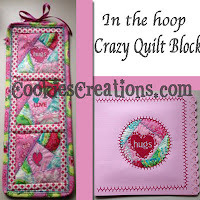 Sew yourself a mini quilt by watching the video featured in the post of January 19, 2013. Because of the mini size: Cut the starter patch from a 3.5" square, and cut strips 2.25" wide x 4.5" in length. You just need to go around the starter patch one time. Again, watching the video will make this very clear. Size the finished block to 4"x 4". The blocks are sewn together using 1.5"sashing strips. The binding is made using a 2.5" by 40" strip of fabric folded in half lengthwise, right side out. The strip is then sewn to the front edge of the mini quilt, raw sides touching, using a quarter inch seam and then either machine stitch or hand stitched to the back.